Get Your Home Organized for the Holidays with the PUPA Movement! Okay friends, it’s time to get our homes organized for the holidays. The earlier we start, the less stressed we’ll be and I’m all up for that. But this year we’re going to do it a little bit differently. I’m intentionally not calling this a declutter challenge and instead calling it the PUPA Movement. What in the world is the PUPA Movement you ask? Well let me explain. PUPA, which stands for Pick Up, Put Away, is something dreamed up by my 19 year old son. One day we were talking about how much I love to putter around the house and how essentially that’s one of the reasons my house stays so organized. And he said “well all you’re really doing is walking around picking stuff up and putting it away”. Why yes, yes I am. And because he thinks he’s so funny he then said “you’re not puttering your PUPAing”. As you can imagine, he pronounced PUPA as poo-pa and it made me laugh. He told me I had to use it on the blog because it’s so catchy. I couldn’t agree more so here we are! Let’s have some fun with it! A declutter challenge centers around purging stuff in our homes that we no longer use and love. And this is absolutely an important part of the Organizing PROCESS. We definitely can’t neglect it. However as we go into the holidays, it’s time to address all the things in your home you want to keep. These are the things currently cluttering your countertops and dressers. Your coffee tables and end tables. Maybe even your floors! During busy seasons we tend to dump and go and as a result surfaces pile up. There are many reasons this happens such as limited time, energy, systems and routines. Or we simply hate making decisions and are too overwhelmed by it all. That’s where the PUPA Movement comes in! I’m calling it a movement because it’s something we need to do regularly, every day in fact. We need to make time for it to keep our homes healthy and functioning properly. So my hope is by encouraging you to build this PUPA habit every day for the next 30 days you’ll not only be able to relax and enjoy the holidays but you’ll experience the benefits for years to come. Doesn’t that sound good? And you only need about 15 minutes a day to do it. At the bottom of the printable I’ve added some of the excuses we tell ourselves for not getting our homes picked up and organized. The blank lines are there to help you narrow down how you can combat each of these excuses. Remember success starts with a plan! Every day I want you to practice picking up and putting away FIVE things. Walk your home and you’ll find plenty of things to put away. Because we live and use our homes daily, it’s only natural that things get put down to deal with later. Now is later! To alleviate overwhelm we are going to commit to a little bit at a time. Five things is manageable. For instance, the change you emptied out of your pocket but left by the front door instead of in the designated change bin. Don’t have somewhere to keep change? Quickly come up with a solution by using something you already have on hand. If you don’t have the time, you’ll want to refer to the three box system below. Of course that’s going to mean more work for you later. Wherever possible and as time allows, do your future self a favor and implement a quick solution right away. But at the same time don’t let it bog you down. How about those clothes tossed on the floor that need to be hung up or the mail sitting on the counter that needs attention. Or there’s that board game that was played with but still sitting on the coffee table. And the magazines scattered about. The list goes on and on. You know all the things I’m talking about. Let’s get those surfaces cleared!! For items that you can’t deal with immediately you’ll need a system to address. And three boxes (laundry baskets or bins) is all your going to need. Label them donate, needs a home and tasks to be done. Donation box – this box will be your purge bin. If some of the items you pick up are no longer being used, immediately place them in this bin for donation. Here are some questions to ask yourself when contemplating whether or not to keep something. Needs a home box – many of the items cluttering our surfaces are there because they don’t have a permanent place to be stored. If you can’t figure it out as soon as you pick up an item, then put them in this box as a temporary solution. For example, if you have light bulbs sitting on your kitchen counter because you don’t have a space to store them, place them in the bin and move on. It’s not ideal but at least it’s off your counter for now. Remember this isn’t permanent and we’ll deal with these items later. Tasks to be done box – then there are all the items that require an action of some kind. For instance, the shirt sitting out because it needs a button sewn on or those library books that need to be returned. How about that casserole dish that needs to be given back to a friend or those pants that need to be exchanged at the store. We leave them laying out so we don’t forget about them. Yet piles attract piles and before we know it you can no longer even see or use the surface under the pile. A space cluttered with stuff is not a usable space. Get in the habit of checking your task basket as you head out the door to see if there is something that can be done while you are out and about. Ideally this should be something the whole family participates in every day. That can be challenging though so I’ll leave that for you to decide. You may need to develop the PUPA habit yourself before you’ll be able to convince others that PUPA is the way to go. Practice yelling out, it’s time to PUPA and see what kind of reaction you get. Haha! If you would like to take things to the next level with specific tasks to tackle, sign up for my newsletter below. 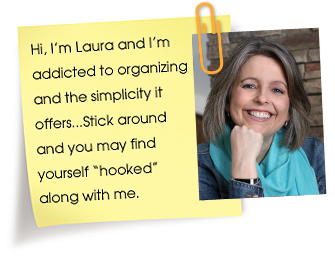 You’ll receive my FREE 100 Organizing Tasks to Tackle printable. Already a subscriber? You can find the password and link at the bottom of every email I send. Now let’s go PUPA!!! Who’s with me?? If you have any questions for me, be sure to ask!